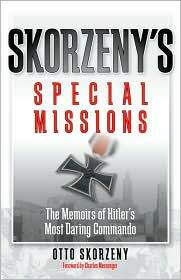 Skorzeny's Special Missions: The Memoirs of Hitler's Most Daring Commando - Jimmie Aaron Kepler, Ed.D. “Skorzeny’s Special Missions: The Memoirs of Hitler’s Most Daring Commando” by Otto Skorzeny. Zenith Press has produced an excellent new edition of the book. Prior to reading the book I did not know of Otto Skorzeny. He isn’t a well-known World War II German soldier. From a little research I found his memoirs had been originally written in German. At first, the book didn’t grab my attention. Maybe this was because I had never thought of viewing World War II from the point of view of a German commando. As I read the book I found Otto Skorzeny does something few do. He lets us into his mind. It helped me understand his point of view. The book is action paced. It experience commando action as if you were there. The more I read the more I came to realize this book is one of the must read, must have books of World War II. I would call the book historical literature and a required study for all World War II buffs. The telling of the story of the rescue of Mussolini is worth the purchase price alone. You learn that Skorzeny was selected for the mission because Hitler was aware the shared an Austrian heritage. The story of how the German intelligence learned of Mussolini’s location is amazing. You experience the planning and execution of the mission. You experience the concept of the operation down to Skorzeny deployed his unit. After the Mussolini mission you journey with Skorzeny to France to put down a possible coup whose mission is the overthrow of the Germany loyal Vichy government. The threat failed to materialize. Skorzeny became involved in research and development of tactics and the weapons needed for commando operational support. You travel with him to the Russian front were he began commando operations. You next find him back on the western front. Here he used one of the most controversial attacks deployed during the war. He used English-speaking German soldiers to work behind American lines during the Battle of the Bulge. The detail of the plan is shared including its development, organization, equipping, implementation, and what caused the plan be found out and it failure. It is always interesting to look at military events from a different point of view. Here you get the best insights into German commando operations. It is amazing. It is worth the purchase price and should be part of your library. After reading the book, I believe no military education of World War II is complete with having read this classic work.